Posted on 05. Nov, 2008 by Fieldhammer. 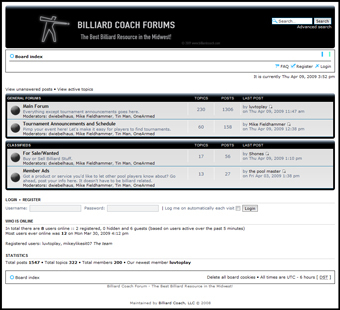 Welcome to BilliardCoach.com. Looking for the new Forums? Here is the link http://billiardcoach.com/forums. I don’t want/need the new forum to be the biggest or best on the web. I would like to unify the pool players of Minnesota and the surrounding area and build a reliable resource. Could the new forum have a complete listing of local and regional upcoming tournaments? Timely results of them? Interesting news of the goings on in the pool rooms of Minnesota? I certainly think so, with your help. Help us build the community and breath much needed life into the Minnesota pool scene. I challenge you to turn our forum into something more than this forum. They’ve got 720 registered users, 1500+ posts, and an astounding 49 members visiting on one December day of last year. It shouldn’t be too hard, right? Here is the link to the new forum. Posted on 30. Oct, 2008 by Fieldhammer. I’m trying to get a new forum off the ground. Take a look, create an account, and join the discussion!